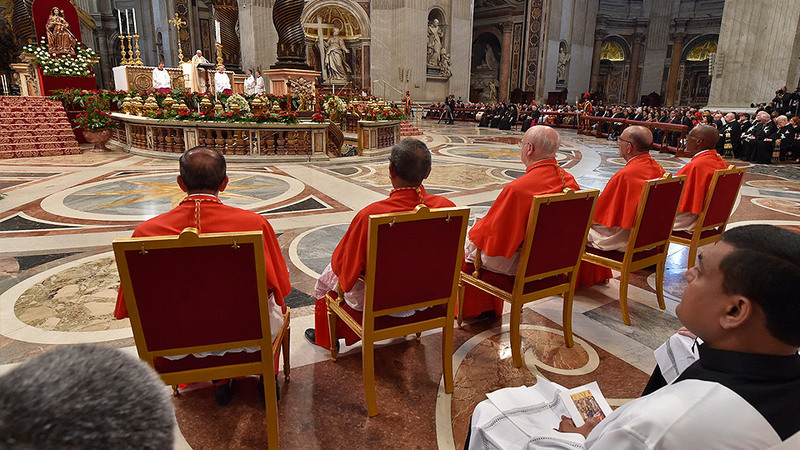 At 4:00 pm today in St. Peter’s Basilica, Pope Francis held a Public Ordinary Consistory for the creation of 5 new Cardinals that included for the imposition of the scarlet beretta, the presentation of the ring and the assignment of the Title or Diaconia. The celebration began with the greeting, prayer, and reading a passage of the gospel according to Mark (10: 32-45). The Holy Father then read the formula of creation of the Cardinals and proclaimed solemnly the names of the new Cardinals, proclaiming their official order. The Rite continued with the profession of faith of the new Cardinals before the people of God and the oath of fidelity and obedience to Pope Francis and his successors. The new Cardinals, according to the order of creation, knelt before the Holy Father who imposed on them the scarlet zucchetto (skull cap) and the cardinal’s beretta, followed by the presentation of the ring. The Pope also assigned to each Cardinal a church of Rome as a sign of participation in the pastoral care of the Pope in the diocese of Rome. This was followed by the exchange of peace between the Pope and the new Cardinals. “Jesus was walking ahead of them”. This is the picture that the Gospel we have just read (Mk 10:32-45) presents to us. It serves as a backdrop to the act now taking place: this Consistory for the creation of new Cardinals. Jesus walks resolutely towards Jerusalem. He knows fully what awaits him there; on more than one occasion, he spoke of it to his disciples. But there is a distance between the heart of Jesus and the hearts of the disciples, which only the Holy Spirit can bridge. Jesus knows this, and so he is patient with them. He speaks to them frankly and, above all, he goes before them. He walks ahead of them. For the reality is completely different. It is what Jesus sees and what directs his steps. The reality is the cross. It is the sin of the world that he came to take upon himself, and to uproot from the world of men and women. It is the innocent who suffer and die as victims of war and terrorism; the forms of enslavement that continue to violate human dignity even in the age of human rights; the refugee camps which at times seem more like a hell than a purgatory; the systematic discarding of all that is no longer useful, people included. This is what Jesus sees as he walks towards Jerusalem. During his public ministry he made known the Father’s tender love by healing all who were oppressed by the evil one (cf. Acts 10:38). Now he realizes that the moment has come to press on to the very end, to eliminate evil at its root. And so, he walks resolutely towards the cross. We too, brothers and sisters, are journeying with Jesus along this path. I speak above all to you, dear new Cardinals. Jesus “is walking ahead of you”, and he asks you to follow him resolutely on his way. He calls you to look at reality, not to let yourselves be distracted by other interests or prospects. He has not called you to become “princes” of the Church, to “sit at his right or at his left”. He calls you to serve like him and with him. To serve the Father and your brothers and sisters. He calls you to face as he did the sin of the world and its effects on today’s humanity. Follow him, and walk ahead of the holy people of God, with your gaze fixed on the Lord’s cross and resurrection. And now, with faith and through the intercession of the Virgin Mother, let us ask the Holy Spirit to bridge every gap between our hearts and the heart of Christ, so that our lives may be completely at the service of God and all our brothers and sisters.